For those who love Google Chrome, or for fashionistas who want their internet software to be as cool as their couture, Google has lured several top British designers to produce themes for its browser. The likes of Mulberry and Vivianne Westwood (and even the TechRadar team have heard of her) have produced skins for Chrome. "A bit like painting your nails to match your outfit, or changing your make-up to reflect the occasion, we've found that people like to customise their technology too," said Kate Hammond, Product Marketing Manager at Google. "With people spending ever more time on the web, these designer themes bring a little more style to your internet experience," she added. And for those with more international tastes, you can also plug in a D&G, Donna Karan or Oscar de la Renta design instead. We think that last one might be a boxer, but, regardless, the results sure are pretty and, obviously, stylish. 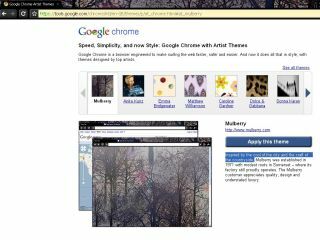 You can go to google.com/chrome/artists to take a look and pick out your favourite. For the record, TechRadar writers prefer the Mulberry theme – not because it's "inspired by the cool of the city and the craft of the countryside", but because we like trees.